Aromatherapy is becoming more popular by the day. 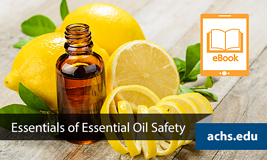 We see essential oils advertised in storefront and online shops, as well as on websites and social media. But, is that recipe you found on Pinterest really safe to use? How can you find out? Fill out the form to download this free, expert-written eBook.